This post is the last in a four-part series. In these posts I remind myself and other Flathead Lake paddlers about some of the risks and rewards of early season paddling. In early June of 2010, on a cool but clear morning, I drove up to the Walstad fishing access with the thought of paddling to Wild Horse Island to see what flowers were in bloom. On this day I saw something I had never seen before. The memory of this experience reminds me to keep venturing into the world of early season paddling. This early in the season there are only a few trucks and boat trailers in the parking lot. I take a minute to walk out on the dock and assess conditions on the lake before setting Bluebird in the water. The jet stream flows in a straight line from the southwest—unlike the mid-summer norm. Wind from this direction means I’ll have a quartering tail wind and corresponding waves as I cross to Wild Horse Island. I adjust myself mentally to what it will feel like to be pushed from the stern quarter. I slip Bluebird into the water and settle myself, feeling for a low center of gravity before advancing into the waves that create an awkward rolling motion. Assisted, even if awkwardly by waves I cannot see, I make the crossing quickly and soon slide above the tumbled ramp of island shallows. I round the island’s tail and drop into Skeeko bay. I love to hike on the island at this time of the year, so I haul Bluebird out of the water and roll the boat over in the shade of one of the big pines. I tuck my wetsuit, pfd, and booties in the cave of the cockpit and switch to more comfortable clothes and footgear for the hike. Before starting up the trail to the isthmus I check the State Park log. I discover, somewhat to my surprise, that no one has recorded an earlier visit to the island this year. Looking forward to whatever I may discover, I hike up the ridge, down into the canyon between peaks and then back up to the top of the middle peak. As memories are attached to places, I recall that this saddle between peaks was important to friends who died in a January crossing of the strait. I come to pay my respects to other people who loved this island. I move quickly and fairly quietly through the soft bunch grasses and the windblown pine needles. It feels good to walk on the moist, almost spongy ground, so unlike the conditions in August or September. Below me to the right I spot five big deer and a red-tail hawk. From this high vantage point I take time to look at everything around me, searching for movement and anomalies. 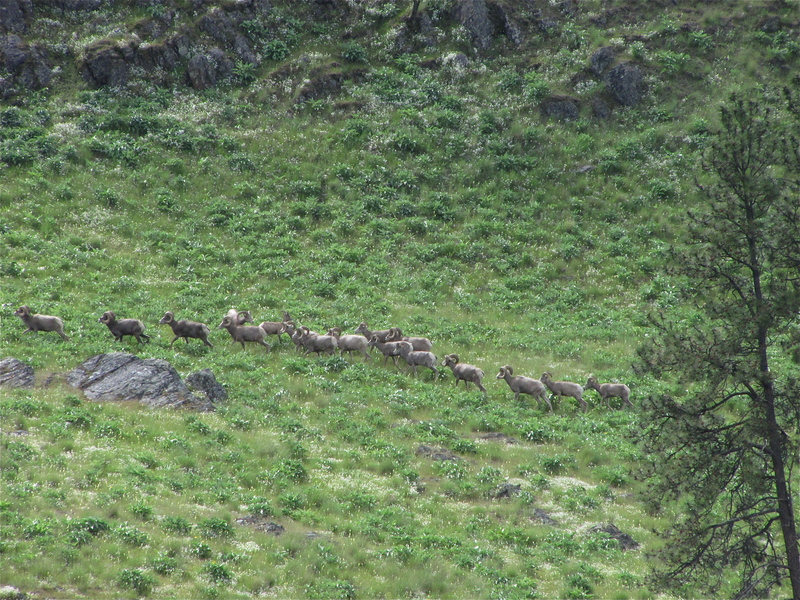 Taking time to look before moving, I find Bighorn sheep in the distance. They are bedded down in the trees. On a scabby, west-facing slope I find dozens of Bitterroot, blazing out of the windblown gravel like pink stars. It feels as if springtime is rising out of the ground and into my legs. Pleased with everything I see, I drop back into the canyon then pant up to the west peak. Before skipping down to the bay I take time to look south. From this last high point I see something that startles me. It looks as though the forest is on fire. Thick clouds of smoke rise up out of the trees and billow away in the wind. The smoke is thick enough to cast running shadows over the forest and grasslands below. Remembering the Mann Gulch fire and the fifteen men who got caught in an upslope conflagration, I don’t want to be caught in a similar situation. Needing a good decision, I study the scene below. It eventually dawns on me that the smoke is the wrong color—yellow not brown or gray. I suddenly realize that the wind is blowing pollen from the pine trees not smoke. Pollen streams from the trees in enormous yellow plumes that look like smoke. This explains why I saw so much pollen on the water while in mid channel. All is well. From an ecological perspective the timing of the wind and the release of powdery pollen have met each other perfectly. Astonished by the conjunction of such things, I continue my descent more amazed than afraid. Always rebounds upon itself (#30). Trying not to rely on force, I paddle on, accept rather than resist the quartering seas off the starboard side. As near as I can tell, I was the only person on Wild Horse Island today, the only person to see billows of pollen so dense that they cast shadows over the undulating slopes. Though the weather at this time of the year is volatile and the water still cold, I am grateful for a chance encounter with the perfect timing of the living world. 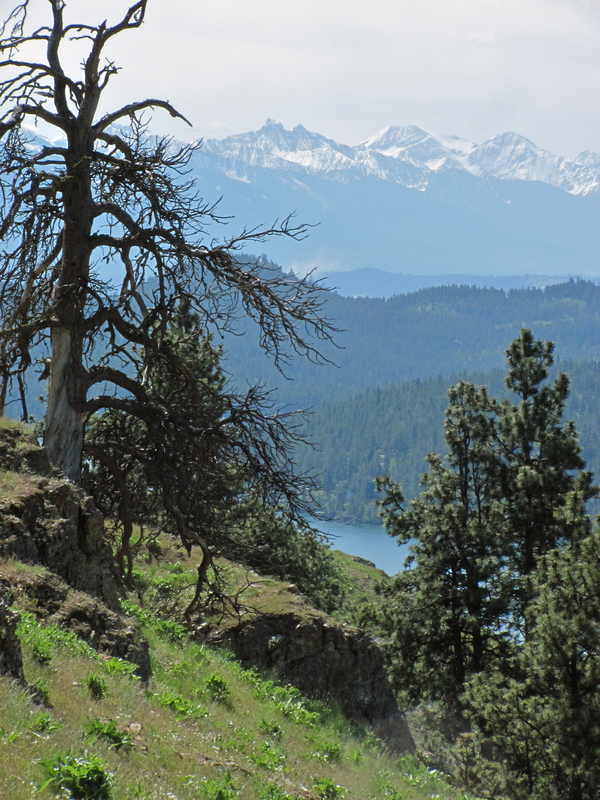 This entry was posted in Spring Paddles and tagged Flathead Lake, kayaking, Rocky Mountain Bighorn Sheep, sea-kayaking, Wild Horse Island by kestrelgwh. Bookmark the permalink.